Product prices and availability are accurate as of 2019-04-06 12:38:19 EDT and are subject to change. Any price and availability information displayed on http://www.amazon.com/ at the time of purchase will apply to the purchase of this product. The Autumn Blaze Red Maple, Acer fremanii, 'Autumn Blaze', is an extremely fast-growing maple with brilliant red fall color. Under good conditions it can grow 3ft. or more per year. It is tolerant of clay soils and droughty conditions. This deciduous tree develops a dense oval head with strong branching which makes it a popular shade tree as well as an ornamental tree. Autumn Blaze Red Maple trees were developed in North Central Ohio. This tree will grow in a wide range of climates from Michigan to Central Florida. 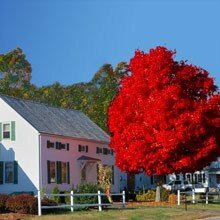 Landscapers and home owners use this popular tree in many settings. This product is shipped bare root and planting instructions are included. Growing Zones 4-8.